Thai Salmon Curry (serves 4-6) Super Delicious, Super Fast! | Crappy Kitchen - Good Dinners! 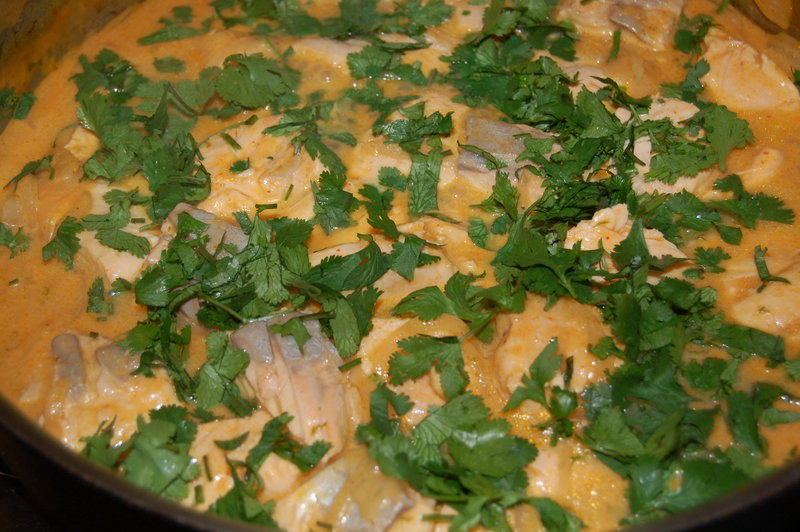 Thai Salmon Curry (serves 4-6) Super Delicious, Super Fast! Last night was one of those evenings when I wanted to try to please everyone but it also needed to be kind of fast as I had too many other things to do!!! This is what we ended up having and it was out-of-this-world delicious! Delicious Thai Salmon curry for dinner last night! I wanted fish and lucky for me, my daughter was craving salmon. My son wanted “anything Thai” and my man Dave would be grateful for whatever was put in front of him – after all, I am the one cooking so that sort of negates him making culinary requests in my opinion! 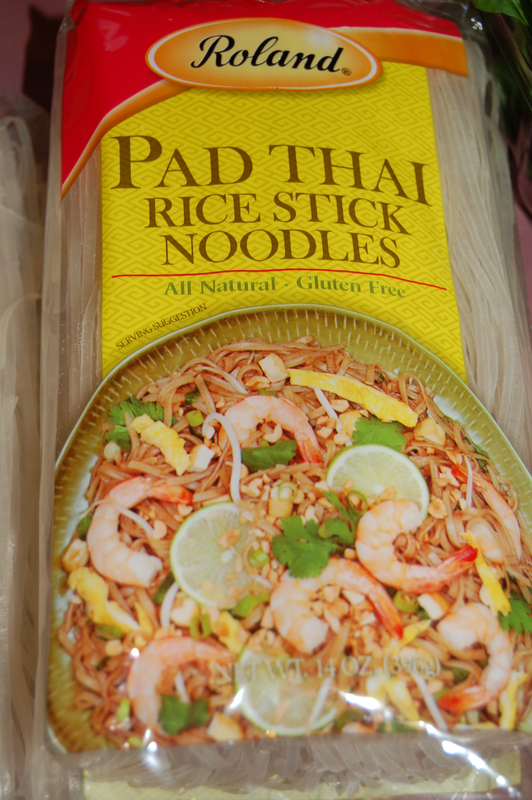 Roland Pad Thai Noodle Brand – I think this is the best brand of imported noodle available. If you cannot find these, try whatever you can find! This was a lightening fast thing to make and my advice to you is to have red and green Thai curry paste stored in your fridge and a couple of cans of coconut milk in your pantry and you will always be ready for a dish like this. It was ready from start to finish in 30 minutes and was so simple to prepare that the next time we make this my daughter can don the apron for the event. 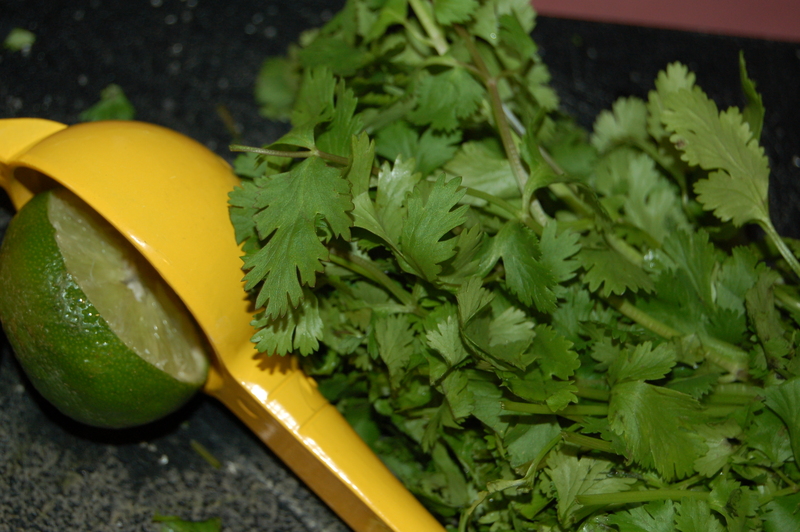 lime and cilantro – the perfect combination of freshness to garnish the finished dish! 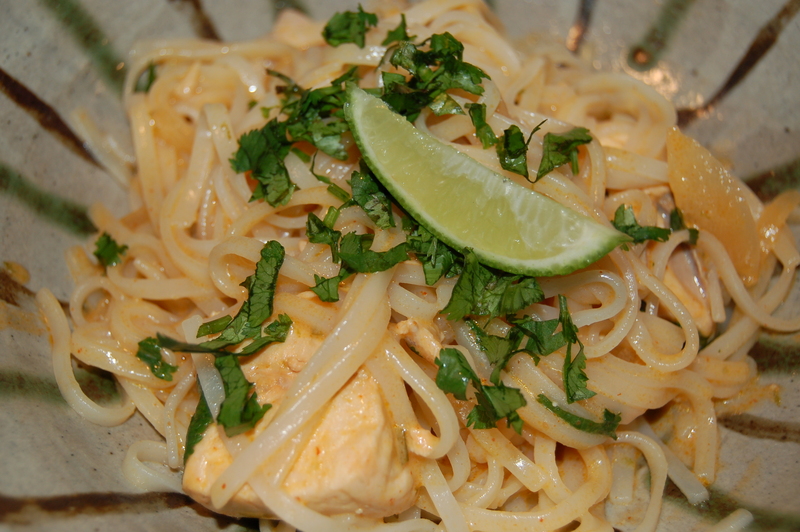 1 box (14oz approx) rice noodles – they are sometimes labeled rice stick noodles and Pad Thai noodles. 1 – Put big pot of water on stove for rice noodles. When it comes to a boil, cook noodles according to instructions, then drain in colander and rinse with cold water – this will prevent them from becoming gummy and stop them from cooking further. Leave them in the colander until you are ready to add them to you dish. 2 – Put large pan (big enough to hold the entire finished dish) on medium heat and add the oil. When it has warmed up, add the onions and cook them for about 5 minutes, stirring frequently. Add the red curry paste and continue to cook for another 3 minutes. 3 – Add the coconut milk, sugar, fish sauce, line juice, lime zest and broth to pan. Bring to a simmer and cook for about 6 minutes before adding the fish. Bring back to a simmer and cover with lid. Cook for between 6 – 8 minutes depending on the size of your fish. Turn heat to low and add 1 cup of the cilantro (the rest is for garnishing). 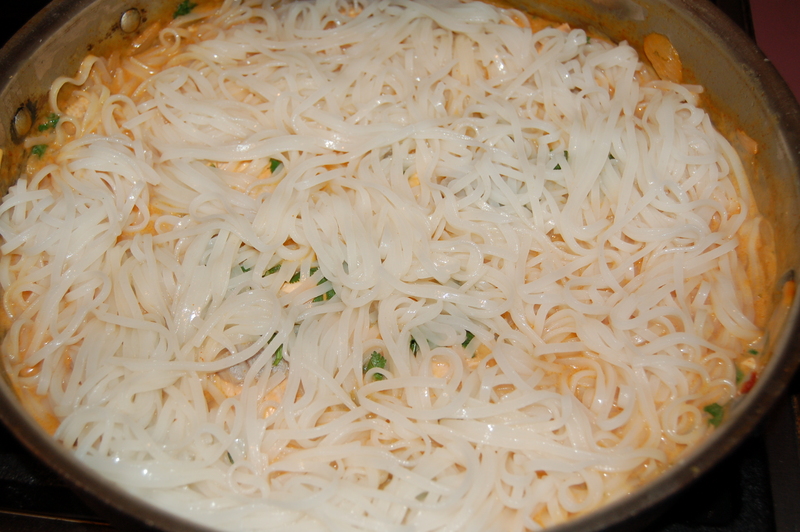 4 – Place the cooked drained rice noodles on top of the dish and cover with lid. Let stand for 5 minutes so the noodles can reheat before serving. 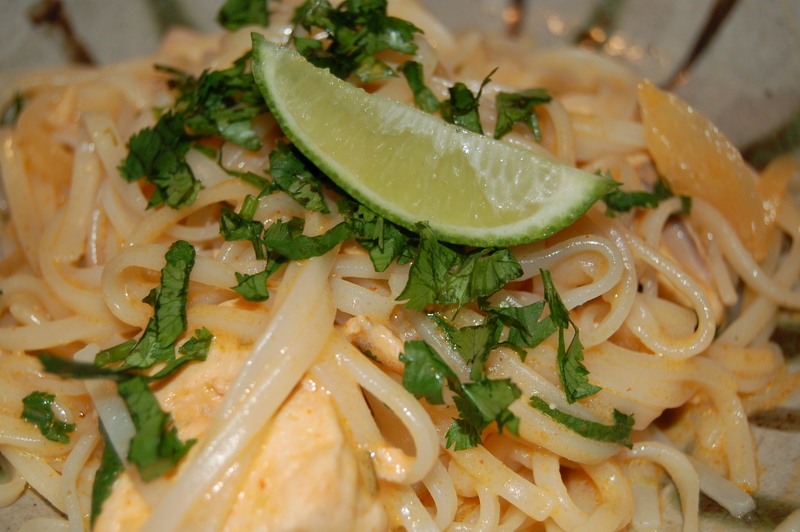 spread rice noodles over the top of your dish and cover to reheat. Serve in bowls or dinner plates with some lime wedges and a sprinkle of fresh cilantro.